Amazing Drumming Monkeys is a variety show aimed at 2-8 year olds but which is also great entertainment for all ages. From tiny crowds at kindies, to huge crowds at festivals, the Monkey show travels around Australia all year round. Their old site hadn't been updated in many years and needed an update. The Monkeys also wanted to be able to update parts of the site themselves. 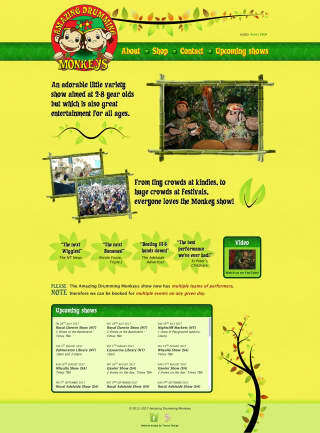 Tyssen Design gave the site a fresh new look which conveyed the sense of fun and colour that is a large part of the Monkeys' show. We also set up a basic method for the Monkeys to update their busy schedule of gig listings easily. Brilliant! I love my new site, and John at Tyssen Design was a pleasure to work with. His work was quick, his suggestions were very helpful, his art work was great, and his communication was clear and to the point. I highly recommend Tyssen Design, and will continue to use their services. Like to say hello? Give us a call on (07) 3300 3303, send us an email to enquiriesnull@tyssendesign.com.au, or a message by filling in the form below.